Instead of attaching to a wall, like most acoustic panels, baffles are suspended from high ceilings. With a choice of plastic tie and screw mounts or a steel cable assembly, ATS Acoustics’ baffles will be hanging long after installation. They are built to last with their aluminum frame that sits just inside the fabric. With crisp square-edge lines that last, this design on’t look like bags or pillows over the course of time. They are often used in auditoriums, gyms, sports arenas, commercial/industrial buildings, and other large spaces. Sometimes baffles are a better choice than wall panels, because baffles leave the wall space free for a desired look or other uses. Baffles are also more efficient than wall panels because both sides of the baffle are open to the air and absorbing sound. 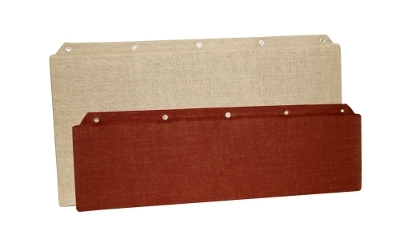 At ATS Acoustics, customers have the choice between two different sizes of baffles: a 24” x 48” x 2” or a 12” x 48” x 2”. Additionally, these baffles have the choice of 27 different fabric colors, including original fabrics and Guilford of Maine fabrics. With our easy-to-read Baffle Installation Guide, you will have your baffle hanging in no time!